Through another one of the numerous techie competing standards stories, (the TL;DR summary being that NTSC TV standard was considered a bit rubbish on this side of the pond and as a result in Europe we developed two alternative standards PAL and SECAM) in the UK and the USA we ended up with two somewhat incompatible TV systems. In the USA they had TV pictures with a vertical resolution of 480 lines, playing at a frame rate of 30 frames per second, whilst on this side of the Atlantic we were watching a higher resolution 576 line picture, but playing at a frame rate of 25 frames per second. The TV companies had ways of converting pictures between the two standards, and eventually we got to home video recorders being able to play tapes recorded in the other standard, and TV’s that could cope with both, indeed these days in the UK you’ll find most DVD or BluRay players and TV’s will quite happily switch between European 50Hz standards and the North American 60Hz, whatever the standard of the material that was put into the machine. That brings us to me watching a video last night which involved a number of shots of trains going left to right or right to left across the screen, and a really annoying judder as the trains went past. I was watching from an HD video file playing back on our Apple TV through Plex. Thinking it was a problem with the Apple TV I tried it through Plex on our Xbox One – same problem, and watching the raw file on the desktop, same problem again. Looking at the file it had come from a UK production company and was encoded in 1080p with a frame rate of 25 frames per second, perfectly standard UK file. So I took a look at the Apple TV. Digging into the settings I had the picture standard set to Auto, further down it said it had automatically set itself to 1080p 60Hz. There was also an option to specify which picture format to use, with a 1080p 50Hz option, so I switched that over, watched the file again, and away went the judder, switch back to auto and the Apple TV would decide to switch to 1080p 60Hz. The basic problem seems to be that unlike the DVD Players, video recorders or BluRay players the latest generation of devices like the Apple TV or Xbox, even though many are capable of switching the resolution, automatically go for 1080p 60Hz and then behave as if the TV they’re connected to is a dumb panel that can’t cope with any other standard, as a result they then try to convert video at another frame rate in software. The judder I could see on the video is a result of the Apple TV or Xbox trying to show 25 frames per second on a device that is wanting 30 frames per second, so on smooth movements you get the judder because 20% of the frames in any one second of video are being shown twice. Knowing my TV is a European model that can cope with a 50Hz picture I can switch the Apple TV over and it works fine (not so for the Xbox incidentally) but then if I watch a North American video at 30 frames per second the Apple TV is locked in 50Hz and has much the same problem trying to handle showing 30 frames in the period when it only has 25 frames. At this point the cinema purists are going to point out that there is another very common frame rate, with is 24 frames per second, which is the frame rate that most movies are made at, and many BluRays are now released as that standard because again a lot of TV sets these days will cope with the frame rate. So what do the Apple TV, Xbox and other TV streamer boxes do? They try and show those 24 frames in whatever frame rate the box is currently set to, and have exactly the same problem. Going through my digital videos I have a real mixed bag. Most of the UK stuff is 25 frames per second, some where it has come off film is 24 frames per second, US stuff mostly 30 frames per second. Looking at home videos I have the same mixed bag, primarily because even though they’re all UK bought devices the cameras and phones I’ve had over the years don’t always produce UK standard video, for example iPhones using the standard camera software will consistently record in 60Hz standards – you have to resort to apps like Filmic to get the phone to record in European 50Hz standards, or even 24 frames per second if you want to work with cinema standards. So even though world has agreed the size of a picture, there is still no agreement over how many of those pictures are shown per second. Most of our digital streaming boxes either will only work at the US 60Hz standard (the earliest Sky Now boxes were stuck on 60Hz) or are switchable but thanks to the software are difficult to switch across – the Apple TV you have to go rummaging in the settings, on the Xbox you effectively have to con the Xbox into thinking your TV can only do 50Hz pictures before it will switch – with the devices doing a second rate job when your TV is quite often perfectly capable of playing things back correctly. Having one standard is never going to work as we’ll still have vast amounts of archive content at the older frame rates, so for the moment it would really help if the digital streamer manufacturers actually started acknowledging that there are a variety of standards – even your average US consumer who doesn’t have any 50Hz content is going to notice glitching if they watch a movie. We’ve had DVD and Video Recorders that could switch for years, why is it that the new tech seems to have taken such a massive step backwards? I guess like a lot of IT professionals I provide a lot of informal IT support for friends, family and local organisations. Usually it’s sorting out minor problems, giving a bit of advice, but over the past couple of weeks I’ve had two Windows 7 computers come up, quite separately, with exactly the same problem. In both cases the main user account on the PC has suddenly started coming up with an error “The User Profile Service failed the logon. User Profile cannot be loaded.” when the user tries to log on, at which point the user is dumped back to the log on page – either a log on box or list of users depending on what has been configured. The users affected don’t remember anything unusual – the previous time they used the account nothing untoward happened, and both PC’s had up to date virus and malware protection installed. The other user accounts on the PC are unaffected, and going in as an administrator the problem account still seems to exist, and passwords can be reset, but the user can still not log on to their account. 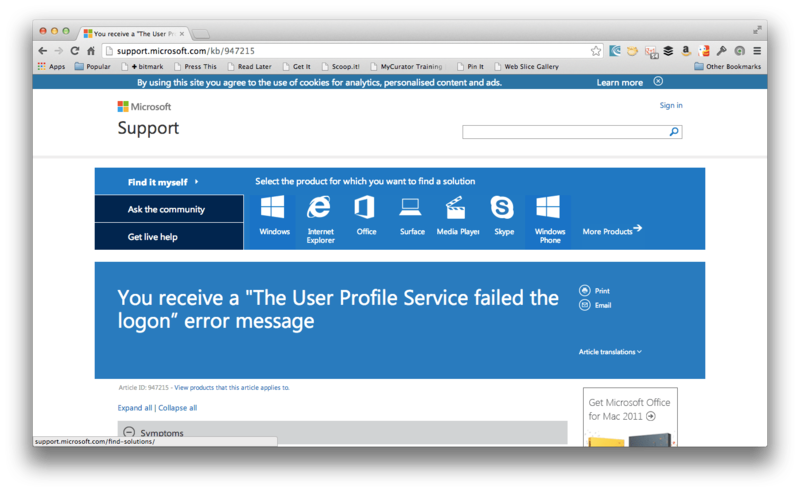 Having had a trawl through the Microsoft Knowledge base there is an article that . Following the first set of instructions for fixing the problem in both cases the registry entry for the real user profile has been renamed to .bak, and a duplicate created pointing at the temporary folder. Removing the duplicate and renaming the .bak back to the original SID name, and then resetting the RefCount and State values back to 0 solves the problem, so it’s pretty easy to solve. However it’s curious that two PC’s have gone down with an identical problem within a couple of weeks of each other, so has anybody else come across the same problem? Since the launch of Windows 8, sales of Windows devices in the US have dropped 21 per cent compared to the same time period last year, NPD said. Notebook sales dropped 24 per cent, but desktop sales fared a bit better with a smaller 9 per cent decline. One of the more annoying omissions from the Microsoft Entity Framework is the out of the box ability to easily trace the SQL statements produced by the framework. In the past we’ve got around that using Community Entity Framework Provider Wrappers which includes EFTracingProvider that can log the generated SQL statements to the console or to a file. However in our most recent project where we are trying Code First, it runs into a bit of a problem as the EFTracingProvider uses the ObjectContext whereas Code First is based on the newer DBContext. A trawl around the Internet can find various posts about how to get the providers to work this post being probably the most complete example. The big issue though is that they all require some degree of extra code to con the provider into working with the DBContext, and they all ran into various issues with our Code First solution, most often related to the parts where the solution generated the initial SQLServer Compact database. However with some more digging I came across a solution in the form of the Clutch Diagnostics EntityFramework package on Nuget. The package wraps up another project, the excellent (and free) MiniProfiler which whilst it is designed for use in web projects is adaptable enough to be used in other ways. The Clutch Diagnostics EntityFramework only needs a couple of additional lines in the start up code for the application, and then an implementation of IDBTracingListener to send the traces somewhere. There are several of these available, but for our purposes it was really easy to write our own. The big advantage is that there is no need to make any changes to the DBContext, so the code can be easily and automatically removed for releases. For an example of how to implement IDBTracingListener, check out my answer on Stack Overflow. Last night Microsoft announced their new tablet, the Surface. There is a good summary of the key points here: . However it is an interesting move, as the article above says, this is a big change for Microsoft who aside from the XBox haven’t ever built hardware – you’ll never have seen a PC actually made by Microsoft for example. This however is how Apple have made their money and built their platform by tightly controlling everything. There is still more we need to find out though, Microsoft haven’t talked prices, although we can take a fair guess that the price points will be competitive, and the release dates are a bit vague. The other thing that may well cause confusion is that what they’ve announced is actually two machines, one is an ARM based iPad rival, the other is an Intel based PC that will be able to run normal Windows applications. Whilst you could say that Apple do the same with the MacBook Air which is a similarly portable computer, Apple clearly delineates the Air from the iPad. Despite all the trumpeting, this is going to be a difficult sell for Microsoft, they are a long way behind, and maybe more so than in the phone market, iPad is synonymous with tablet, indeed much as people refer to vacuum cleaners as a Hoover, people refer to all brands of tablet as an iPad. However it will certainly be a positive move if Apple has some serious competition, and whilst only time will tell whether this will be the tablet to really compete, this certainly seems to me to have a better chance as unlike Android and iOS devices there is a level of compatibility already with what is in use in corporate environments.